The first time I had pozole was when I was about 25 years old. 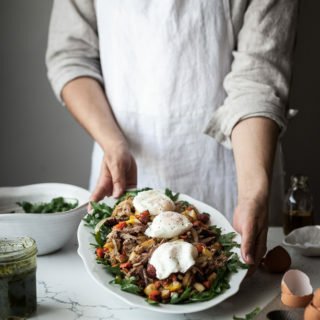 My Mother-in-law would make it on occasion and I loved it so much that if we happened to be staying over and she served it for dinner, I would devour several bowl-fulls the next day for breakfast. Toppings and everything. Pozole for breakfast may seem strange but if you know me at all, you know that soup for breakfast is about as normal as I get. And if you tried my Mother-in-law’s Pozole, you would want it for breakfast too. Maybe. She makes it in a pressure cooker along with some incredible Anasazi beans and after I discovered that the pressure cooker was a necessary tool in making super soft, creamy beans, I decided it was high time I purchased one. And so I did. I ordered one and anxiously awaited it’s arrival. The day it showed up, I unwrapped it and admired it in all it’s glory. Then, I decided that the prospect of using it to make the Pozole that I had intended to cook for dinner was utterly terrifying (WHAT?! Pressure cookers come with a LOT of warnings, folks!) and seeing that blowing a hole through my roof was a definite possibility I turned to a tried and true, less potentially house-annihilating cooking method. 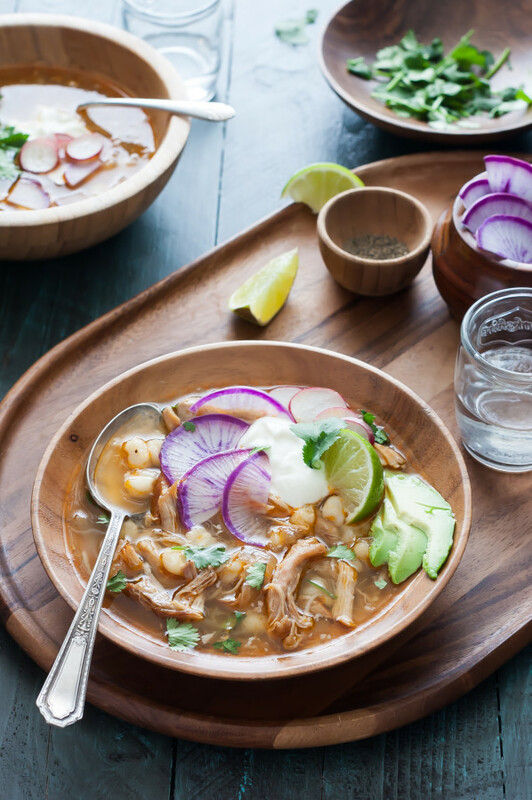 So, being the coward I am (I did get brave, by the way, and used the pressure cooker later that day to make beans) I threw my Pozole ingredients in the slow cooker and 8 hours later I had a richly flavored broth filled with tender pork and savory kernels of hominy. 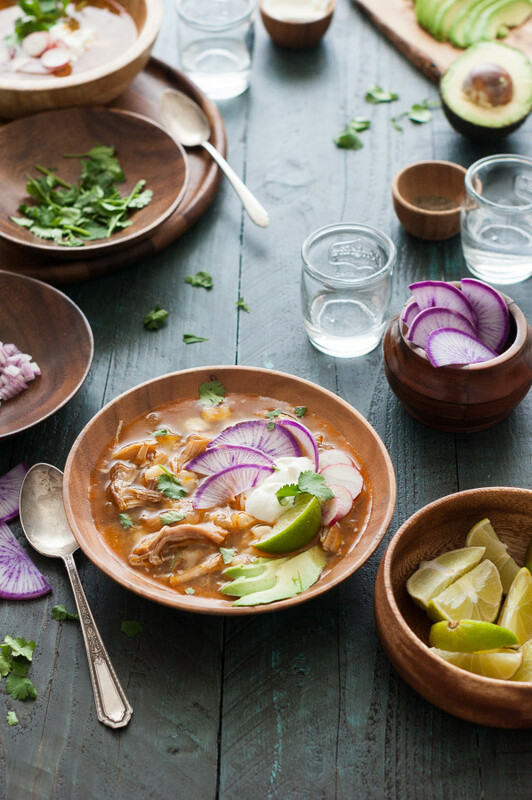 The best part of a Pozole, mind you, is the toppings. You can put so many delicious things on top. My favorites are sliced radishes, lime wedges, sour cream, avocados, crunchy diced red onion, cilantro, and spoonful of salsa. Pozole is rich and comforting, so simple yet complex with its many toppings. It’s what I crave when I want something that is warm, yet fresh at the same time. 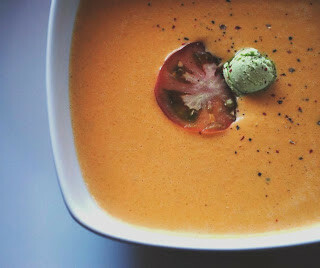 Perhaps someday I’ll put on my big girl pants and try making this in the pressure cooker. 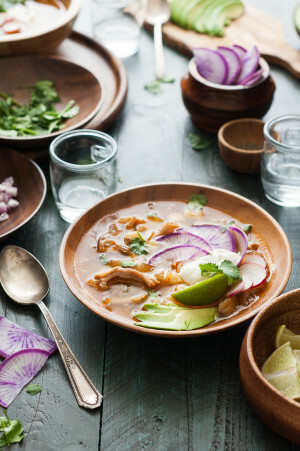 They key to getting the deepest flavor possible in your Pozole lies in the browning of the pork. The very first step in the soup is to brown the pieces of pork in hot oil. You don’t want to burn it, of course, but make sure that every side of the pork is a deep golden brown before you remove it from the pan to cook the onions and spices. The bottom of the pan with be full of those browned bits of meat and when you add the chicken broth to the pot it will all dissolve into the liquid, rendering it incredibly rich and flavorful. Salt and pepper all sides of the pork. Heat the oil in a large pot. Add the pieces of pork and cook until browned on all sides. 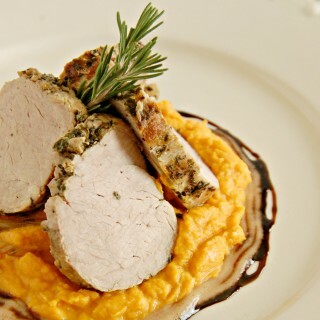 Set the pork in the bowl of a slow cooker. Add the onion, garlic, chili powder, and smoked paprika to the pot and saute for 4-5 minutes, or until the onion is soft. Add the chicken broth and bring just to a simmer. Remove from heat and pour over the pork in the slow cooker. Add the hominy to the slow cooker, cover, and cook on high for 4 hours or low for 6-8 hours. 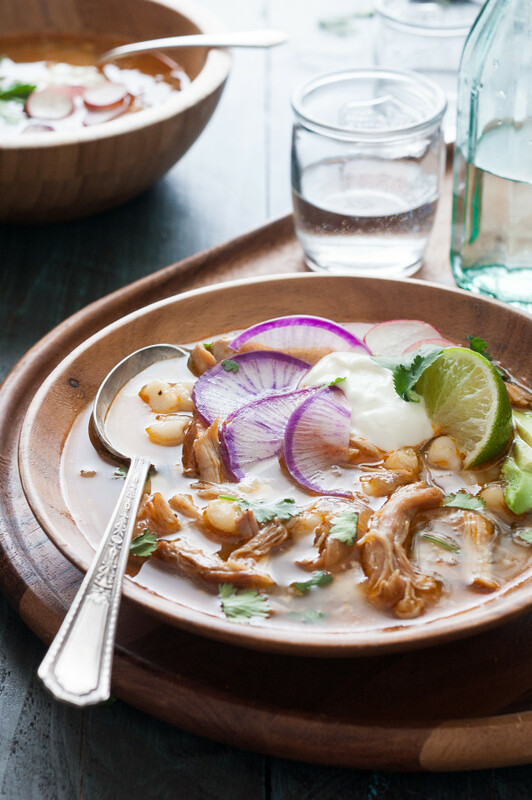 When pozole is finished cooking, place the pieces of pork in a bowl and lightly shred. Add back in to the soup and check seasonings, adding more salt, if desired. 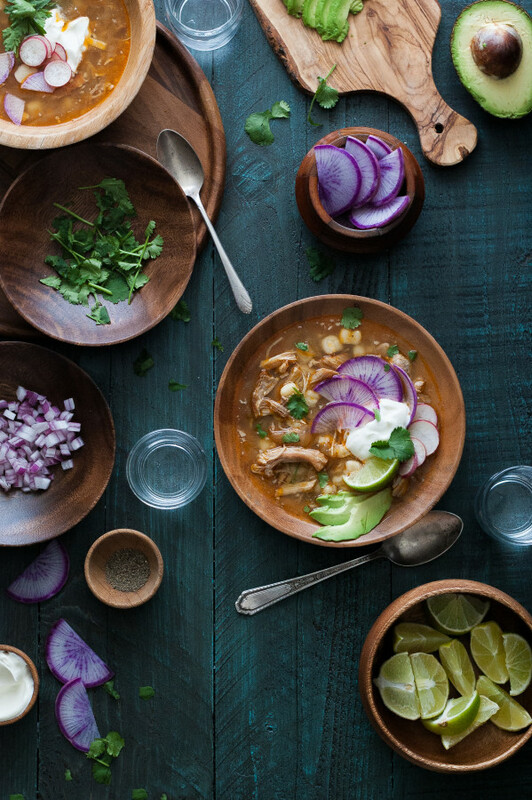 Serve pozole in bowls garnished with desired toppings.